In Bloom Music Festival: 2-day music festival happening all day Saturday and Sunday at Eleanor Tinsley Park. Check out my In Bloom guide for some tips to make the most of your weekend. Some acts I'm most looking forward to: Grizzly Bear, Say Girl Say, Explosions in the Sky, Sylvan Esso, Houndmouth, Twin Shadow, and of course, Yoga by Black Swan starting at 11am. More info. Bayou City Art Festival: the largest art festival in Houston which only happens twice a year with over 300 artists. Every fall, the event is hosted downtown. Every spring, the event is hosted at Memorial Park. The event is both Friday-Sunday and you can find discount tickets at Randalls for $10. More Info. 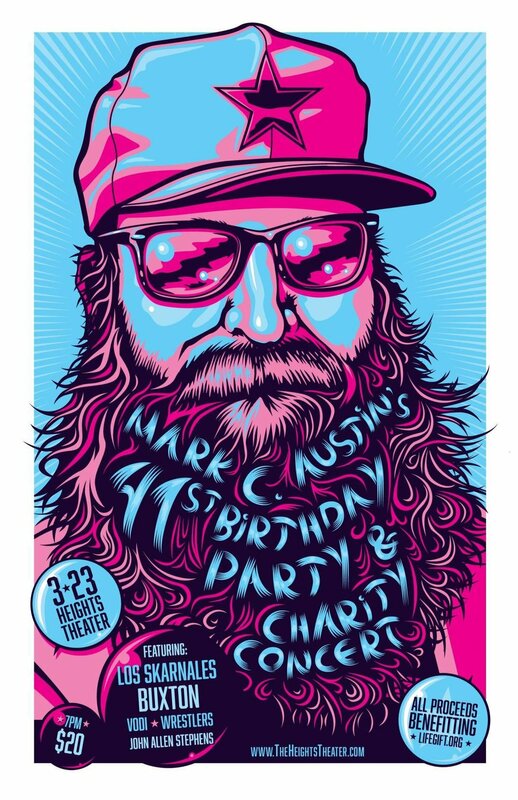 Mark Austin’s Birthday Party: One of Houston’s most influential music people is turning a year older, and throwing a birthday party and concert to celebrate. There will be performances by: Los Skarnales, Buxton, Vodi, Wrestlers, & John Allen Stephens. Tickets are $20 and all proceeds go to LifeGift, which offers hope to the thousands of people in Texas and beyond who need lifesaving organ transplants. The event is Friday night at Heights Theater on 19th. More info + tickets. Free Yoga at Rothko Chapel: get your zen on at one of the most calm and inviting places in Houston: Rothko Chapel. Yoga starts at 9am and is brought to you by Bayou Bliss Yoga. More info. Free Yoga at HTX Sports Creek: join @Fitnessintheloop every Sunday for Free Yoga at HTX Sports Creek. Enjoy yoga on the blue soccer field, tacos by Tierra Caliente, and mimosas after yoga. Also, mark your calendars for 4/8 and 4/22 because Gibson will be teaching free yoga at HTX Sports Creek those days! More info. The Lemon Climb at Chase Tower: For the first time in years, you can go to the top of Chase Tower and get a stunning view from the top of Houston’s tallest skyscraper. The only catch is that you have to climb your way to the top, while raising awareness and money for Alex’s Lemonade Stand Fund: a national childhood cancer foundation that raises money for research into new treatments and cures for children fighting cancer. (Shout out to Meredith for making this impact and event!) Register here. 5th Annual Kite Festival: This event is great for kids, and not so great if you don’t like kids. There are kids and kites everywhere. The scene is surreal, and worth checking out if you’ve never been. Biking is strongly encouraged so you don’t have to worry about parking. This event is 10-5 at Hermann Park. More Info. Bayou City Outdoors Graffiti Art & Bike Ride at Market Square Park: Bike around the city and explore some of the best street art Houston has to offer. Meet Sunday at Market Square Park at noon and ride around with other art-loving bikers. This event is 12-4pm. More info. If I missed listing a cool event happening in Houston this weekend, let me know in the comments! I'd be happy to add it.